Great question, moms and dads! To answer you, I’m going to get a bit clinical (forgive me). Worry is a cognitive process and happens in a different part of the brain (a higher part). Worry is an active process: it’s the thinking, imagining, “what if” part of our brains. Anxiety, however, comes from a lower, more primitive part called the amygdala. 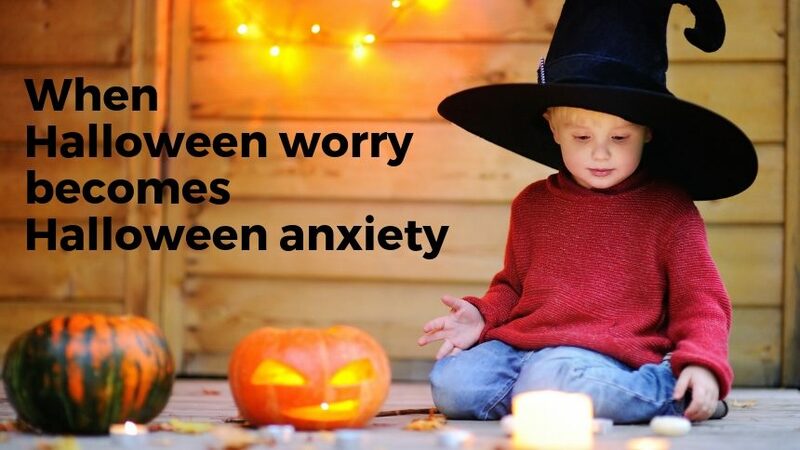 Anxiety really refers to the physical symptoms of fight, flight or freeze and can be triggered by worry (“what if I see a scary costume?” “what if I get separated from my parents trick or treating?” “what if my candy is poisoned?”) or real or perceived danger, like someone jumping out at you like in a haunted house. Even though we often use the terms interchangeably, it was the ever-inspiring Lynn Lyons who really changed the way I think about and approach treating worry and anxiety. They are different, and here’s why it matters. when I’m talking to a child and/or parent(s) about anxiety, I’m going to make sure they understand all about the amygdala, when it’s likely to go off and what false alarms might set it off. We’ll then make a plan for tolerating the physical symptoms. If we’re working on their worry, we’re going to spend more time learning how to talk back to their worry both in my office and in different real-life situations where their worry (and anxiety) are likely to show up. Both worry and anxiety are normal emotions, and kids need to know this. Worry is going to show up any time we feel uncertain or uncomfortable. It’s just how it works. Everyone feels better when they have a plan to tackle their challenges, and this process gives kids and parents the skills to do just that. And that’s why my approach focuses on developing that process. Instead of worry or anxiety controlling them, they start regain control.